Athina Sporting invites you to join us in Romania hunting European quail. Hunts take place on the Danube Delta, Romania, flying into and out from Bucharest. Teams of approximately 4 hunters shoot over pointers – with approximately 100 birds being shot per day amongst the group. Quail shooting takes place in the mornings, around half an hour transfer time from our accommodation. Dove and pigeon shooting is often available in the afternoons – or further quail shooting, depending upon numbers of birds. 3* Accommodation is provided, which is individual suites, with food provided. All hunt prices include all shooting, food, transfers, lodgings and firearms permits. Additional costs as required: shells, bar bill, and cash tips. Individual hunters are welcome and additional dates are available to suit. 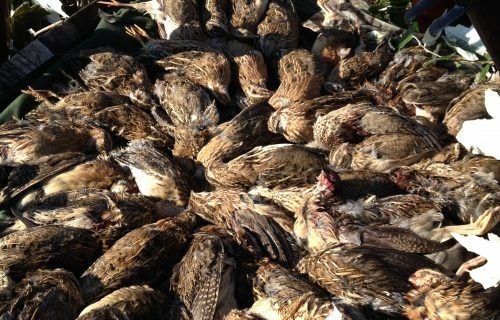 Prime hunting season for quail is Romania is during the Autumn months, as the birds migrate to the rich fields along the River Danube. August 25th – 29th (4 nights and 3 days shooting). Flights available daily into and out of Bucharest. £1280 per person – includes all shooting, transfers, food, accommodation and firearms permits. 5 nights and 4 days shooting are available at £1580 per person. Contact us to arrange your hunt today.